January 30 marked the first day of the spring, 2017 semester, and Vilma Espinoza, 23, a transfer student from the Borough of Manhattan Community College, expressed optimism. She was one of several students interviewed about their first week of the semester, a time traditionally rife with horror stories about cancelled classes and unexpected schedule changes and other happenings – like the constant reminder that school elevators in the North Building are running slower than ever or, and, the escalators aren’t working or the faucets in the bathrooms provide cold water only or this campus is overcrowded and needs more space. The Astoria, Queens, resident plans on declaring a major after this semester, she said in an interview in front of the third-floor student cafeteria. She said she liked the variety of classes offered and that she hoped to get her bachelor’s and master’s degrees from Hunter in an accelerated program. On her first day of classes Espinoza got lost a few times navigating the campus, but she said she made friends who helped her find her way. 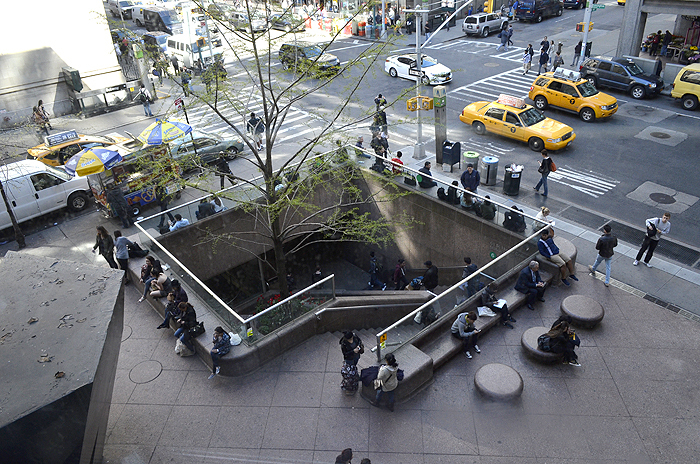 Sitting in the bustling third-floor corridor connecting the North and West buildings, Espinoza, who wore blue jeans, a floral shirt, a black jacket and was carrying a black bag, talked about her experience taking a Saturday statistics class. It was an interesting experience, she said, because of the few people she saw roaming the hallways, a scene in marked contrast when the corridors can be jammed during peak hours during the week. She enjoyed this experience because it gave her a chance to study, she said. Donnell Griffith, 21, a transfer student from Borough of Manhattan Community College, described his first week of classes as “pretty swell.” Sitting in the lobby of the West Building, the Bronx resident, an English major with a concentration in creative writing, said that during his first week of classes he said it appeared to him that Hunter students seemed more passionate about their education than at his previous school. Griffith, wearing a green shirt and wearing a blue hat, said that he noticed that many students whom he met knew what they wanted to do and were in majors that they believed would help them achieve their goals. 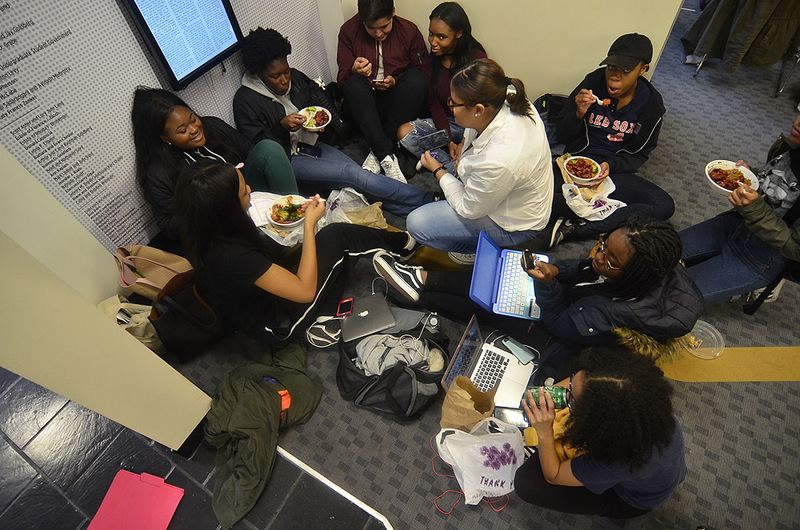 At BMMC, students seemed like they just wanted to “get things done,” he said. Sitting in the corridor in front of Room 504 in the North Building, Nicholas Roman, 23, spoke about his final semester. Roman, a media studies major who lives in Jamaica, Queens and was dressed in a graphic T-shirt, black jacket, jeans and black boots, said that his first week was fairly standard, with nothing out of the ordinary occurring. During a discussion with fellow student journalists about the first week of classes, Jessica Flaumenbaum, 28, said that a political science class she was supposed to take this semester was cancelled. This was an issue for the Mill Basin resident because the cancellation could negatively impact her GPA. Making matters worse, the class is only offered during spring semesters, and Flaumenbaum, who was dressed in a purple flannel and brown high-waist pants while sitting in Room 503 of Hunter’s North Building, was hoping to graduate in the fall. Flaumenbaum, a media studies major, considered taking the course at another CUNY school, but it was only offered at Hunter. 68th Street Lexington Avenue stop of the Number 6 Train. Picture taken from third-floor corridor. Also sitting in Room 503 of the North Building, student journalist Caitlin Munson said that students weren’t notified in time about the cancellation of a Spanish class she had enrolled in. The Mill Basin, Brooklyn, resident, 20, dressed in blue jeans, sneakers and a grey sweater with an image of a hamburger, French fries and a drink, with a black jacket hanging over the back of her chair, said that she had to wake up at 5:50 a.m. to get to the 8:30 a.m. class on time – only to learn that the class was cancelled and the professor wasn’t even in the country. Lesley Battaglia, a high school teacher, offered lessons on news literacy while covering the election in class. Some colleges and universities started offering courses on news literacy, according to an article headline, “The new civics course in the US schools: How to spot fake news” in the Chicago Daily Herald. According to a new law in California, news literacy lessons and courses must be offered in grade schools and at colleges and universities, one such university is Kean University. ← The President Tweets and the World Shudders: What Say Hunter Students?